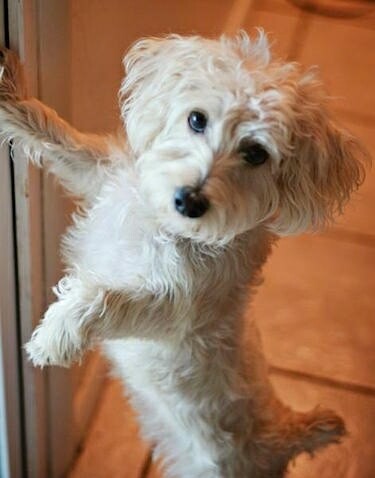 Weinsten the Afghan Hound / Bichon Frise mix at 1 year old—"Winny or Weinsten is a Afghan Hound Bichon mix or Afghan Chon as the breeder told me. He's funny, easy to train, Very vocal, and loves dogs and kids. He already knows the commands retrieve, grab (object name), open the gate and close it, and the seven basic commands. 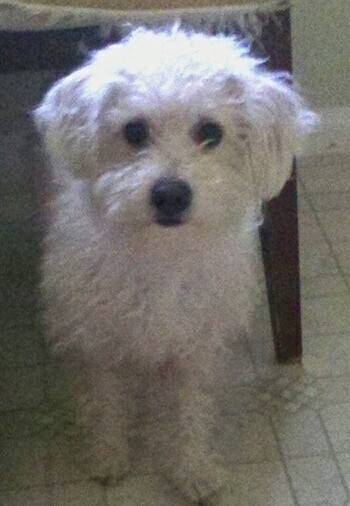 He has mostly his mom's Bichon so he's white and small but one of his siblings looks like a Standard Poodle!" The Afghan Chon is not a purebred dog. It is a cross between the Afghan Hound and the Bichon Frise. The best way to determine the temperament of a mixed breed is to look up all breeds in the cross and know you can get any combination of any of the characteristics found in either breed. Not all of these designer hybrid dogs being bred are 50% purebred to 50% purebred. It is very common for breeders to breed multi-generation crosses.